An illustrated collection of poems about everyone’s favorite season. 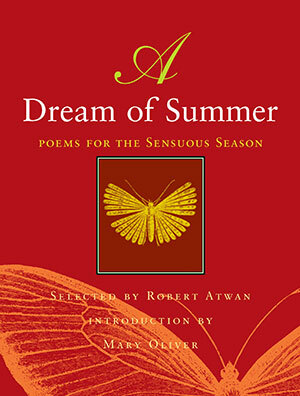 A Dream of Summer assembles thirty-seven evocative poems on the experience and joy of summertime. Illustrated throughout with pen-and-ink drawings, this volume focuses on the sensuality of summertime and the varieties of summer experience. It is a love letter to the sultry heat, crashing thunderstorms, endless days, and short, mild nights. Gathered here is work by illustrious poets of the past, among them William Shakespeare, Emily Dickinson, Walt Whitman, John Keats, and Alfred Lord Tennyson, as well as more contemporary artists like Louise Gluck, Yusef Komunyakaa, Marge Piercy, and Charles Simic. Renowned poet Mary Oliver contributes an introduction, musing on this most enchanted and favored of seasons. Other contributors include Sharan Strange, Galway Kinnell, May Sarton, Robert Frost, Louise Bogan, Wallace Stevens, Denise Levertov, Robert Hayden, Derek Walcott, Marge Piercy, and many more. Biographical notes by editor Robert Atwan offer brief lives of each of the poets included in the volume.